But first, a reality check. If you plan to do something with your horse—show him or otherwise compete with him—you’re still going to pay a lot of money for a registered horse, especially if the horse is well-trained and a consistent winner in his division (hunter/jumper, Arabian, barrel racer, etc.). But if what you want is a trustworthy friend to ride on the trail, he’s out there. It’s up to you to find him, and you probably won’t have to work very hard. If possible, try not to fall in love with the first horse you look at. Ideally, make a list by looking in the classified section of your local paper. If you live in the country, look for ads posted at your local feed store. Go on-line to find rescued horses available for adoption. If you still want a horse of a specific breed (gaited horses are becoming more and more popular as the human population ages), most breed organizations sponsor rescue groups the same way dog clubs (Golden Retrievers, for example) sponsor rescue groups throughout the country. Ideally (there’s that word again), you should have a list of six to eight horses in your area that you think you’re capable of riding and taking care of before you actually get in your car and start your search. First, phone or email the owner to discuss each horse and ask to see photos or videos. Rescue groups, in particular, are diligent about matching a potential owner with a horse to suit her, because they know if you two don’t get along, they’ll get the horse back. 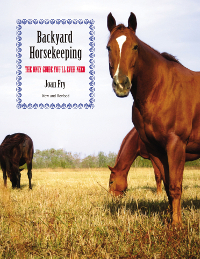 But if you buy a horse from an individual (owner, breeder, or trainer), that person’s first priority is usually money: “I have to unload this horse on somebody—he’s costing me too much to feed.” And that person may not be willing to take him back. If the person agree to take him back, ask to have that agreement in writing. Make sure the person you talk to about every horse on your list knows your situation—that you have or haven’t owned a horse before, that you have or haven’t ridden for a while—and what you plan to use your horse for if you buy him. Don’t let a minor conformation defect keep you from buying a horse you like. 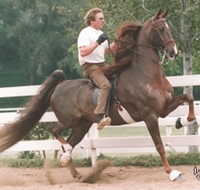 I bought Prim, my old American Saddlebred mare, from a breeder I knew. She understood that I was interested in dressage but didn’t plan to compete, and what I really wanted was a well-mannered trail horse. She and I both knew that Prim (not her registered name) simply didn’t have the conformation to be a show horse. 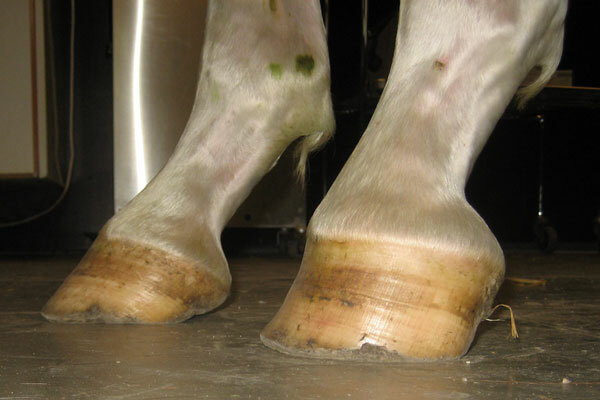 She has a club foot in front—her right hoof turns out slightly, and she grows much more heel on that foot than she does on the other three. It’s not severe, and if I wanted to compete in Country Pleasure, for example, it would be easy to shoe her so she looked and trotted “square.” But custom shoeing is even more expensive than regular shoeing (I bought her unshod and she’s gone barefoot her entire life), and most Saddlebred owners who are competitive don’t want a horse with a club foot. But as a trail horse, Prim’s defect (and most people don’t notice that she has one) wouldn’t be a problem. I bought her as a three-year-old and she’s now 25, and it has never been a problem. And don’t let age be a reason to cross a horse off your list, especially one that’s had a good, solid training background and is otherwise sound. Horse rescues usually have many elderly horses available for adoption. So do individual owners. A neighbor of mine has a wonderful old gelding who takes care of anybody on his back, even small, know-nothing children. Part of my fondness for American Saddlebreds goes back to my own childhood, when I took care of my next-door neighbors’ horse. I don’t know how old he was, but I would guess around fifteen, and between him and his owner, I learned the basics of good horse care and good riding. The real reason I bought Prim? My first pick (a Thoroughbred mare) didn’t pass her vet check, and when I went to the breeder’s barn and stood in front of Prim’s stall to evaluate her one final time, she nickered when she saw me, walked to me and rested her head on my shoulder. Who could resist a horse like that? I couldn’t.